Share the post "Quick plays: VINDICATA, REVOLUTION HIGHWAY, ROCKICKS"
The “secret weapon” on this debut album might be construed as early Megadeth guitarist Chris Poland (who handles most of the solos) but in actual fact it’s vocalist Mary Magill who provides the major attraction. Against a full metal onslaught, Magill’s vocals shine through. It’s the strength of the songs that determine repeat playability and the album is filled with the catchy choruses including on ‘Death Defying Years’ and ‘Carry My Dreams Away’ whilst ‘Would You’ and ‘Fragile’ are groove-laden standouts where guitarists Jim McCrostie and Brett Pedersen provide relentless metal riffage throughout. Let’s be honest, this isn’t going to win any prizes for originality. It mines a deep vein of hard rock previously well trodden by Messrs. Coverdale, Rodgers and Plant. This is plainly evident on the opener ‘Renegade’ which reminds of ‘Black Dog’ and sums up this band’s meld of Zeppelin via early Whitesnake and latter-day Bad Company. There’s nothing wrong with that, as long as the songs are well constructed and the playing exemplary. And thankfully this self-titled debut does meet these exacting requirements. With main-men, vocalist David Fefolt and Savros Papadopoulos (guitar), eleven riff-driven, ballsy tracks have been fashioned with a high quotient of memorable choruses (including ‘Young And Wild’ and ‘Rollin’ Train’) whilst the longer ‘Sister Of The Devil’ provides suitable respite but is no less impressive. This retrospective set from Rockicks might have been distilled to a more impressive single disc, celebrating a band who flourished briefly in late 1970s Los Angeles. The first disc is impressive, the band’s brand of southern rock purposeful and well executed. The second disc seems to be culled mainly from demos with several alternate versions and the sonic quality doesn’t really do the band justice. However, there’s plenty of evidence of the band’s quality, fast forwarding to 1991-1992 when’Jesse James’ and ‘Get The Lead Out’were recorded. The band were originally signed to RSO and probably didn’t sit easily in that label’s roster (with the likes of Yvonne Ellman and Bee Gees). They released one album – Inside – in 1977 which is featured on Disc One in its entirety together with other tracks which may have been destined for a follow-up. This package is let down by the complete lack of historic information, given also the lack of band visibility over the years. 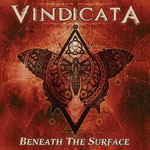 This entry was posted in ALBUM REVIEWS, ALBUM REVIEWS (Mobile), All Posts, Quick Plays and tagged A Retrospective Anthology, album, Beneath The Surface, Chris Poland, hard rock, Keep On Rockin', metal, review, Revolution Highway, Rockicks, Vindicata. Bookmark the permalink.